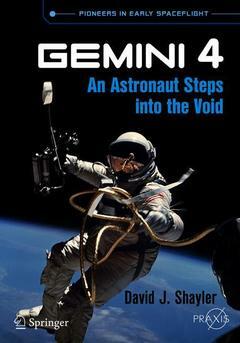 Gemini 4 Shayler David J.
Auteur : Shayler David J.
Preface.- Chapter 1: Stepping into the void.- Chapter 2: Dressed for the occasion.- Chapter 3: Jim and Ed.- Chapter 4: Steps towards space.- Chapter 5: School for controllers.- Chapter 6: "We're on our way, buddy! ".- Chapter 7: He's out! He's floating free.- Chapter 8: A streamlined Gemini capsule.- Chapter 9: Something else up here.- Chapter 10: This thing isn't very big.- Chapter 11: Computer malfunction.- Chapter 12: Final orbits.- Chapter 13: "We're about ready to come down!.- Chapter 14: Post-flight.- Chapter 15: A significant contribution.- Appendices.- Bibliography.- About the author.- Other works by the author.- Index.